We could also call them precious and semiprecious gems; both are valid terminologies. As we know, the human being, since its appearance, has always felt devotion and provide of a certain mysticism to the precious or rare stones or those difficult to find in nature, conferring them different uses: for ornamentation, as a symbol of power and exclusiveness, associated to the cult of certain deities and even using them for healing or for the opposite. Precious and semiprecious stones are, almost in its majority, minerals; some of them are, however, organic (such as amber, vegetal fossilized resin). The scale of hardness of the same (which guarantees its durability), that, in addition, it coincides with the precious stones or gems par excellence (the existing hardest precious stone is the diamond, as we have seen in previous articles). The rareness, scarcity, or difficulty to find them in nature. Su belleza y perfección. Cuando hablamos de la belleza y perfección de una piedra, ya sea preciosa o semipreciosa, nos referimos a su color, brillo, transparencia y pureza. Una piedra preciosa pura, sin imperfecciones y con un color radiante, puede tener un valor incluso superior al de un diamante de similares características. 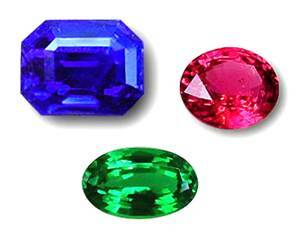 The only three stones or gems considered precious –besides the diamond- by the previous factors are the ruby, the emerald and the blue sapphire. Decades ago, the amethyst was also considered a precious stone, but after the discovery of enormous deposits in Brazil, it became part of the group of semiprecious stones, due to the fact that it was not rare and scarce anymore. Its name comes from the Latin ruber, which means red. Its principal characteristic is the intense and sparkling read color, whose own name indicates. This color is due to the metals that it is composed of, the iron and the chromium. It belongs to the family of the corundum – same as the sapphire- and it has a hardness of 9 on the Mohs scale. It is the hardest stone after the diamond. When it is extracted from nature, the ruby presents a lacked of light and rough aspect, but once the ones which are going to be used for jewelry are selected and polished, they adopt that exclusive and shining tone which makes them so majestic. It is important to take into account that only between the 1% and 5% of the extracted rubies from nature are selected for its use in jewelry. We will learn more details from this stone, which, as the emerald and the blue sapphire, deserve an article of its own. Its name comes from the Persian; it means “green stone”. The emerald has always been highly valued, given that, despite the fact that other green stones existed, the emerald was the only crystalline one. Nowadays we know other green crystalline stones but none of them are comparable in color and transparency to the emerald. It belongs to the family of the Beryllium and it has a hardness of 8 on the scale of Mohs. Only a thirty per cent of the extracted emeralds in the mines are sculpted for its commercialization in jewelry, and from these, only in a two percent of them inclusions are not appreciated at first glance. That is why they are so rare and have such a high value in the market. We will know more data and curiosities about the emerald in the special article that we will dedicate to it. As the ruby, it belongs to the Corundum family. Its distinctive characteristic is its intense blue color; even though there are sapphires from other tonalities, the most valued and appreciated one is the blue sapphire. Any Corundum with a different color from red is named as sapphire; that is why it is named blue sapphire. As the ruby, the blue sapphire has a hardness of 9 on the scale of Mohs. Its rarity increases daily, given that many of the sapphire deposits are currently exhausted and the newly discovered cannot meet the demand. We will dedicate an exclusive article to this precious stone. Semiprecious stones have a very different value among them and it is much easier to get large and pure (clean) semiprecious stones than precious stones of such characteristics. The fluctuation of its value or cost will depend on the same conditions that influence those of the precious stones: hardness, rarity, beauty and perfection (purity, color, sparkle and transparency). There are approximately 130 mineral species catalogued as semiprecious, besides amber, which is a fossilized vegetal resin. Now we will see the most important and used in jewelry. A variety of the chalcedony. It can have various tones and colors –depending on the formation of its microcrystals of silica (quartz)- and be transparent, semitransparent or matt. The formation of agates is due to the flow of subterranean waters that are found in situations of proximity to the silica saturations, to the filling of cavities or interior spaces in the rocks and the dissolution of materials that lie there: shells, bones, etc. The concentric bands of the agates, that remind us to the trunks’ knots of the trees, are a result of this process. The term agate comes from the Greek “Achates”, which is the designation of the river with the same name. Its hardness on the scale of Mohs is of 7. It belongs to the family of the beryl –like the emerald-. Actually, it is a variant of the same, but pale greenish blue. As its name indicates, its color and sparkle remind us of the seawater. Its name comes from the Latin aqua marina, and in the past it was also known as the sailor’s stone. It has a hardness of 8 on the scale of Mohs. An extremely rare variety of the chrysoberyl of a soft green or greenish yellow color. The most relevant characteristic is its capacity to change tonalities and color when it is subject to luminosity variations; it can change from a pale green to a soft red when it is subject to these changes. It was discovered in the Tsar Alexander’s epoch, in Russia; that is where its name comes from, coinciding, in addition, its colors with those of the Russian flag of the period. Its hardness on the scale of Mohs is 8. As we know, the amethyst was considered a precious stone, but, after the discovery of mines in Brazil, it became less rare and thus it became part of the group of semiprecious stones. The Amethyst is the most valued quartz variety in the market. Its most appreciated color is a violet lilac, but it can be yellow and even transparent, depending on the iron quantity that it may contain. Its hardness on the scale of Mohs is 7. Even though it has lost a position and is currently a semiprecious stone, due to its beauty and popularity deserves that, in the future, we write an exclusive article for it. Also called succino (from the Latin succinum). Amber comes from the Arabic and its meaning is “that floats in the sea”, given that amber actually floats in the water. Its most known or common color is yellow, but it can have other colors: orange or cognac, red or cherry, white, coffee or caramel, blue green and finally, moss or black, which includes all dark tonalities of amber. One of the most valued is the red or cherry, coming from Chiapas, Mexico. Amber is not a mineral; it is a vegetal fossilized resin coming from the conifers, which are located mostly in Europe. It was formed from the residual vegetal resin from some trees, and it may have been originated twenty, sixty or even more years ago. During that time, this resin can suffer a process of fossilization, forming irregular and extensive masses inside the strata of sandstone and clay slate of the Tertiary age. In Europe, Amber was formed out of the resin of the Pinus Succinifera, while in America it comes from the leguminous Hymenaea Courbaril, known in Mexico as Guapinol and in Nicaragua and the Dominican Republic as the Algarrobo. It has a hardness of 2.5 on the scale of Mohs. Even though the correct thing would be to call it Aventurine Quartz. It includes various tonalities of green, although it can have reddish, brownish and brownish yellow tones due to the inclusions of other minerals. Its most appreciated characteristic is its inner sparkle when it is subjected to a luminous source and turned over. It is important to take into account that, often buyers are tried to be cheated when offering them aventurines as jade. Jade is much more valuable and rare than the aventurine. It has a hardness of 7 on the scale of Mohs. Or zircon, coming from the silicate family. Its name comes from the Arabic zarqun, which means cinnabar. It is one of the oldest minerals known and one of the most abundant ones. Coming from the crystallization of magmatic rocks, it is transparent, although it can take different tonalities; the yellowish one is called hyacinth. Also called citrine. It is a variant of quartz, but of a lemon yellow color and with its same hardness on the Mohs scale, that is 7. Its name comes from French citron. In the past it had been named “topaz quartz” because of its similarities with the topaz, but we must make clear that both are completely different stones. Greenish yellow semiprecious stone, also called in the past as chrysolite, a name which is currently obsolete. It is way harder than the beryl and it is much used in jewelry. There is a stone close to the 50 carats in the British Natural History Museum. Its name comes from the Greek, which means golden beryl, and it has a hardness of 8.5 on the scale of Mohs. Also known as Chrysoprasus or Chrysophrase. A variety of Agate (chalcedony) of intense dark green. It is the most valued agate from all the ones which belong to the chalcedony family. Its attractive green color is due to the Nickel. 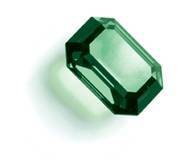 Nowadays it is used as a substitutive stone for the emerald, due to its color and its low cost in comparison to it. Agate of orange red from the Chalcedony family. 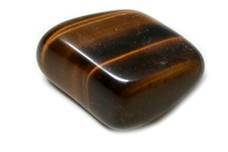 The brown tonality is called Sardonyx. Its high popularity is in some way related with the Muslim prophet Muhammad, given that he wore a cornelian ring. Nowadays it is in vogue in the Italian jewelry. Also called rock crystal, its virtue is its transparency and low cost. Widely used in quality costume jewelry and also in normal jewelry, the rock crystal is, in short, transparent crystalized crystal rock. From the Greek krysallos, which means transparent ice, comes its name crystal rock. And referring to the quartz its argot comes from a German term from the XV century. Its formation is a consequence of the slow crystallization of the residual magmas. Also called Quartz fume and incorrectly called until very recently topaz fume, given that both present very different characteristics. Compound of silica, it has different tonalities of brown, from the very clear to the very dark. Its very dark variety of brown is called morrión (a Spanish word). Its most important property is its close resemblance to the ruby. It can have several colors, from white to blue, even green, although the most valued one is red stone magnified by the iron oxide in combination with magnesium. There is, however, a rare variety of cobalt blue spinel which is highly valued. Its name comes from the Latin spina, which means thorn, in reference to its sharp crystals, given that it is often found in octahedral form. As a curiosity, know that in the past it has been mistaken thousands of times with the ruby; a proof of this is that many jewels of the British Crown which were considered rubies in the past are in reality spinels. Known by all as Moonstone or Lunar Stone, it belongs to the family of the silicates of aluminum, calcium, sodium and potassium or the mixture of the same. Its possible color ranges from a transparent blueish white to a translucent one, but always presenting its particular iridescent sparkle also called adularescence (blue, wavy and winding reflexes that seem to float when the stone is turned over in front of a source of light). Very famous in the Roman Empire epoch, when it was believed that its interior was made of Moon beams. It has a hardness of 6.5 on the scale of Mohs. Of the same color, although it also can also be found in orange, yellow, green and even black tones. It belongs to the family of the silicates of aluminum combined with iron oxide or magnesium; hence its famous reddish crimson color. In the Bible, it is referred to with the name carbunculus. Due to the fact that it is found in great proportions in nature, its cost is relatively low in comparison to the ruby. That is the reason why it is frequently used in jewelry as a substitute of it in order to reduce costs. It has a hardness of 7.5 on the scale of Mohs. Belonging to the Quartz family (chalcedony) but mixed with iron oxide. It is a opaque stone that we can find in several colors, although the most popular is the red one, called blood jasper. It can also be found in dark green, yellow, brown and, sometimes, with a mixture of the previous colors. Its name comes from the Latin iaspis. From the silicate family, mixed with lime and lye and with small pyrite and iron incrustations that confers to it that characteristic veined aspect. Of a deep blue color, widely used in beads for necklaces and bracelets. Its name is a compound of two terms, one with a Latin root, lapis, which means stone, and allazjard, which comes from Arabic and that means sky or in other words, blue. This stone has been highly valued since ancient times; we have data from it for over nine thousand years. Until the XIX century, this semiprecious stone was used to obtain the intense blue color used for oil paintings. It has a hardness of 5.5 on the scale of Mohs. Belonging to the family of the Quartz (chalcedony). It has a varied color between grey, yellow, brown and gold, with some iridescent reflexes as a defining characteristic. This effect is due to the inclusion of quartz microcrystals in its interior that produce that silky sparkle. If it is sculpted in the cabochon form, we will have the feeling of having an eye in front of us. There is a variety of blue, due to its lack of crocidolite. It is called Hawk’s Eye. 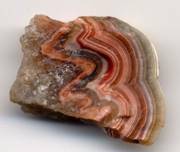 Another opaque variety of agate formed usually by alternating dark and black bands, although there is a variety in light and even reddish tones. Nowadays, we associate the onyx with the black color. The other onyx varieties which are not black are known as sardonyx. Its name comes from the Greek onyx, which means nail, and it is related to the Mythical tale which explains that, when Cupid cut Venus’ nails while she was sleeping, these fell to the Earth and scattered over it. A very rare variety of Quartz. It can be opaque or translucent and appear in different colors: white, grey, blue, orange or black. The opal is a very unique stone with a unique feature: a variety of colors in its interior. This effect is due to the diffraction of light that passes through the spherical transparent microparticles –mostly silica- inside. These microparticles project only pure spectral colors, given that the light angle varies depending on the rectilinear propagations of the waves. It must be taken into account that the opal is very delicate faced with very intense heat and light sources. This is so because in its interior there may be still up to a 10% of non-crystalized water. Its name comes from the Greek opalion. It has a hardness of 6 on the scale of Mohs. Also called olivine. It is made of magnesium, iron and silicon, and although its most popular color is the olive green, we can also find it in other colors in nature. Besides its color, it has a very intense sparkle, a characteristic of the peridot. Its name comes from the French perindon. It is frequent to find it among the volcanic rocks and it has a hardness of 6.5 on the scale of Mohs. In vogue nowadays, we must take into account that it was discovered by the middle of last century, around the 1960’s. It is one of the rarest semiprecious stones, given that there are only deposits of tanzanite in Tanzania. It is a transparent variety of the mineral zoisite. Its variety of color ranges from the violet to the light blue to the dark intense blue. Semiprecious stone widely used in jewelry, due to its beauty and its hardness. Nowadays, the most popular topaz is the blue one, although there is a great variety of colors such as yellow, pink, fume, etc. It must be said that the yellow one had always been considered as topaz. The rarest and most valued variety is the imperial topaz, which has a reddish orange yellow color. No stone can match its color. Its name comes from the Greek topazion. Due to the fact that demand of blue topazes nowadays is larger than the quantity that can be extracted, blue topazes are obtained radiating heat to the colorless topazes. Once this blue color is obtained, it is presented as stable to the eye, but it is very fragile when performing on it any jewelry repair, given that if heat is applied to it again, it will quickly become colorless. Opaque semiprecious stone. It is presented to us in blue, greenish blue and green tones. It is made of phosphate of alumina with a mixture of cooper and iron. Its name means that it comes from Turkey, given that it was thought that was its origin, although in reality the Turks only acted as intermediary between Asia and the Middle East and the West. It is a porous stone; that is why it needs some care and treatment that other semiprecious stones do not need. Very popular in the past and in vogue nowadays.